To my delight most of the vegetation was a challenge even for our gardeners. I went around tasting every leaf, flower and fruit that came my way. 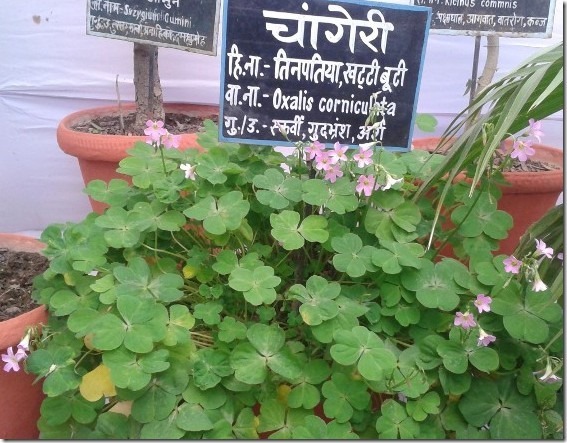 Chaangeri or Indian Sorrel was thus discovered. I called it Khatti Patti, going by the deliciously sweet-sour taste. I did not know that it was a well documented Ayurvedic herb useful in Vitamin-C deficiency, Rhuematoid Arthritis, indigestion and diarrhea. The flowers, fruit and leaves are completely edible and can be used to make green chutney by blending with coriander leaves, mint leaves, salt and a dash of raw mango or lemon juice. Indian Sorrel or Chaangeri springs up in spring and lasts through the rains, almost all over India. It loves sunlight but doesn’t mind a shady patch under the shrubs. I know it to be of two kinds, one has larger leaves and pink-mauve flower; the other has smaller leaves and yellow flowers. Many thanks to the annual flower show at Rajbhawan, Lucknow this year, where I reconnected with my childhood friend -- Chaangeri. Feeling great that I chewed on the leaves of this delectable herb as a kid, trusting nature so completely, without fear of harm. The reward was not in taste alone. It built my relationship with nature and Mother Earth.